Slievemeel is the 845th highest place in Ireland. Making a Meel of it!! I must preface my comments on this hill by saying that I love the Mournes, from its big beauties like Bearnagh to its little hills like the Hen. However, this is one hill that won’t live long in the heart for me or be revisited! Its not that it was gruelling, like Donard on the worst day of winter, I did this yesterday evening on one of the finest days of summer. It’s just that it has no real character, it doesn’t link up nicely with its neighbours like most in the Mournes. By the standards of this area the views are average, with the bulk of Finlieve and Shanlieve blocking views of the greater hills to the north, also, the route I took to the summit was a bit of a mess! I took in Slievemeel as part of a 12k circuit, starting out at the yellow water picnic area taking the summit of Tievedockaragh first. From here I headed over open ground for Slievemeel. As Wicklore had mentioned on the general forum earlier this week, the good weather gives us a great opportunity to get out and walk in areas that are usually boggy. The route between Tievedockaragh and Slievemeel is definitely one of these areas. Being aware of the dangers of Shanlough and the nearby Red Bog I wasn’t aware of any such dangers on the route I took (however, if I did take a foolhardy route and got lucky I would appreciate for some of the wiser ones to advise). 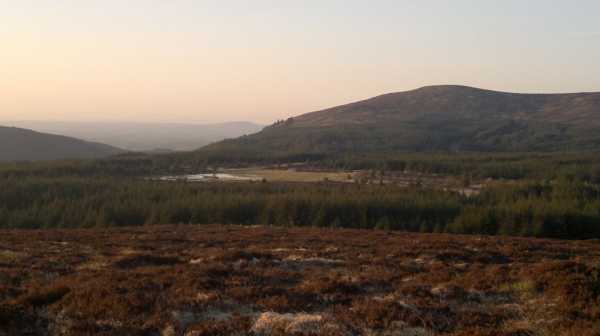 From the summit of Tievedockaragh I headed south for the edge of the forest, from here I simply skirted the edge of it until I reached the far end, at the foot of Slievemeel. From here it was a straight forward ascent to the top of this boggy, featureless hump of a hill! This route was tough enough going in dry conditions, it would be a pure slog in the wet and not one I would repeat, but it did make a circuit!